Saturday marked the first South African date of the Sting: Back To Bass worldwide tour. The concert to celebrate 25 years of Gordon Sumner’s solo career was held at Joburg’s Coca-Cola Dome and, surprisingly for a big international act, two dates were booked at the same venue - the 16-time Grammy Award-winning Sting performing again yesterday. Also unusual was the lack of opening acts. The bassist/vocalist made famous by multiplatinum '80s new wave band The Police played an impressively long set (about 19 songs) without a break. With a few exceptions, the tunes were all classics, stripped down to their barest original bones. The Kama Sutra master’s penchant for going full orchestral or indulging in world-musicky versions of fan favourites was nowhere to be heard. Neither did Sting’s fascination with jazz rear its convoluted head. The idea behind Back To Bass was for the muso to return to his bass-and-vox roots with nothing but his band (and a particularly ugly piece of furniture he calls “the occasional table”) to support him on stage. It was a good call, as the average concert-goer seemed to be between 30 and 50 years old - but then, Sting is 61 years old himself. From the very first chords of 'All This Time', the 10800-strong seated crowd all seemed to wish they were standing up. One audience member ended up on the giant displays after she stood and screamed ''I love you, Gordon!'' Evidently the diminutive brunette was unaware of how little Sting likes his Christian name. The Newcastle-born musician ran away from home in the '70s to join The Police, after playing in numerous jazz ensembles and holding down desk jobs he despised (one of them being tax collector). As expected, the sound on Saturday was spectacular and the playing masterful. There were no light shows or VJ screens - it was simply a musical feast for fans. The set list included hits 'Every Little Thing She Does Is Magic', 'Englishman in New York', 'Seven Days', 'Fields of Gold', 'Desert Rose', 'Roxanne' and the encore, big-space anthem 'Fragile'. It takes a lot to entertain a seated crowd without any visual aids but Sting, along with his two battered '50s bass guitars and his band, father and son team Dominic (lead guitar), Rufus Miller (rhythm), Jo Lawry (backing vox), Vinnie Colaiuta (drummer) and electric fiddler Pete Tickell managed to hold everyone’s attention for the full two hours. Tickell's solos were complex and feverish, while remaining enjoyable. At one point he could have been playing Rimsky-Korsakov’s Flight of the Bumble Bee. 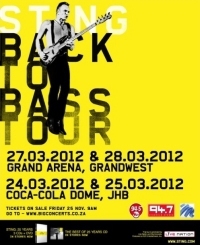 Sting: Back To Bass visits Cape Town tomorrow and Wednesday at GrandWest's Grand Arena. Tickets are about R395 from Computicket. Don't miss it. We were at the Wednesday concert in Cape Town and what a fantastic show it was! Loved the way the band just got on with it and played without a break, apart from a few anecdotes from Sting in between. I was lucky enough to have seen the Symphonicity tour in NYC at the Lincoln Centre, now nearly 3 years ago, and although very different in feel, it was just as enjoyable. But then again, I have been a die-hard Sting fan for over 30 years! Even travelled the long road from Durban to Harare for the Amnesty International Concert all those years ago! The Latest News & Reviews From Sting.com!